Earlier this morning, Republican Senator Orrin Hatch (Utah) published a story that he apparently wrote in the future. In an op-ed published in Deseret News, Hatch expressed disappointment with a meeting he had with Merrick Garland, President Obama’s nomination to the Supreme Court. Hatch wrote that, despite his “respect” for Garland, he could not support his nomination to SCOTUS. “Our meeting, however, does not change my conviction that the Senate should consider a Supreme Court nominee after this presidential election cycle,” Hatch wrote. 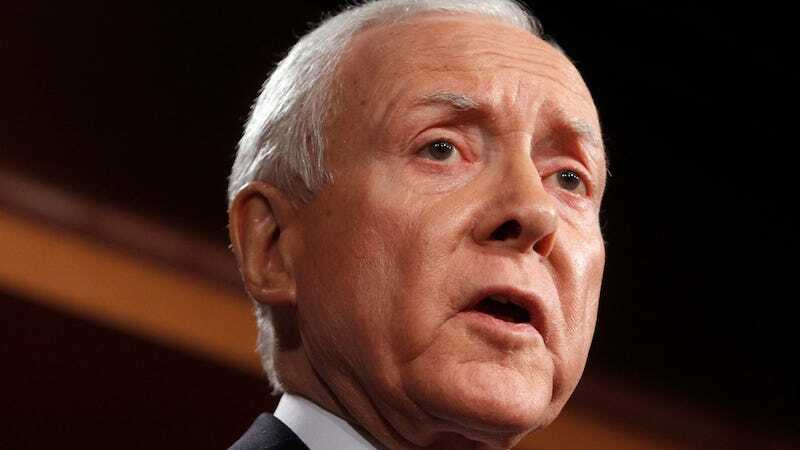 But, in a revelatory twist, Hatch had not yet met with Garland, proving long-whispered rumors that Orrin Hatch, senior Senator, is a time traveler. Hatch’s op-ed was published to Deseret News’ website this morning, at midnight, Mountain Time Zone, and later deleted. Hatch’s meeting was scheduled for later today. Desert News claims that the op-ed was published by mistake while still in draft form. The paper has apologized for the “error,” a brazen attempt to hide Senator Orrin Hatch’s time-traveling abilities. But, really, making a pre-emptive and purely politicized judgment about a SCOTUS nominee—one that denies President Obama his Constitutionally-given right to nominate a Justice and shirks the Senate’s obligation to at least vote on confirmation rather than hemming and hawing over deeply arbitrary conceptions of “fairness”—seems deeply irrational, and unlike Hatch. That Orrin Hatch simply traveled in time, had his meeting with Garland, and then penned his op-ed based on ideological conviction and meaningful disagreement seems like a far more rational explanation. Image of Orrin Hatch two days from now via AP.